The rebels settled in their new base on Hoth. Fearing to have been flushed out by an Imperial probe, they are preparing to undergo the inevitable assault of the Empire, while fighting against the ruthless climate of the ice planet. In Search of Skywalker is a Force Pack for Star Wars: The Card Game that contains 60 new cards to modify your decks. tar Wars: The Card Game is a game of fast fights, strategic planning, subterfuges, allowing two players to fight each other through personalized decks in an innovative way. Be careful this game is an extension of Star Wars: Le Jeu de Cartes and cannot be played alone. 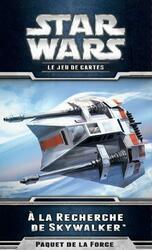 To be able to play it you must have a copy of the game Star Wars: Le Jeu de Cartes .